"We're your family, Dane! You're going to wish you had this time back." 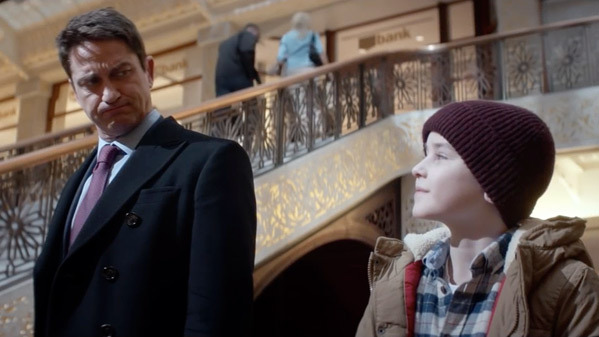 Voltage Pictures has released an official trailer for the indie drama A Family Man, starring Gerard Butler as a career headhunter who must struggle with the work-family balance when his 10-year-old son is diagnosed with cancer. This was originally titled The Headhunter's Calling, and it first premiered at the Toronto Film Festival last year. In addition to Gerard Butler, the full ensemble cast features Alison Brie, Gretchen Mol, Willem Dafoe, Kathleen Munroe, Dustin Milligan, Alfred Molina, Julia Butters, and Anupam Kher. I hate to say it, but this looks so sappy and emotionally manipulative, that it's hard to take it seriously. I'm much more interested in seeing Gerard Butler in Geostorm than I am this movie. But these stories still need to be told. After the boss (Willem Dafoe) of a Chicago-based headhunter, Dane Jensen (Gerard Butler), who works at the Blackrock Recruiting agency arranging jobs for engineers, retires, Jensen finally achieves his longtime goal of taking over the company after going head-to-head with his ambitious rival, Lynn Vogel (Alison Brie). However, upon taking over the company he worked so hard to be in control of, Dane's 10-year-old son, Ryan (Max Jenkins), is suddenly diagnosed with cancer and his professional priorities at work and personal priorities at home begin to clash with one another. A Family Man is directed by filmmaker Mark Williams, making his feature directorial debut after working as a producer (The Accountant, Bad Karma) for a few years. The screenplay is written by Bill Dubuque (The Accountant). This premiered at the Toronto Film Festival last year. DirecTV will release A Family Man exclusively on VOD starting May 2017 this year.